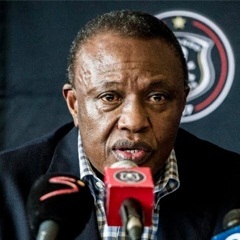 Orlando Pirates chairman Irvin Khoza said that the stability of the club would remain a priority, following the departure of coach Vladimir Vermezovic. Khoza, who is still scheduled to meet with Vermezovic before he leaves, said that measures had already been taken to ensure that the club continues to compete to the best of its abilities for the remainder of the season. "The stability of the team is always a pressing priority. Eric Tinkler will again assume the role of Caretaker Coach until the end of the 2014/2015 season," said Khoza. Khoza did acknowledge that he would have liked for Vermezovic to spend more time at the club, with the view turning the season around, after what hasn’t be the ideal start to the campaign. Pirates are currently sixth on the Premiership standings, having accumulated just 18 points in the 12 matches played thus far. That is compounded by the fact that the Buccaneers have recorded just two victories in their last five matches. Fans have also voiced their disapproval for Vermezovic, after the 2-1 defeat against Maritzburg United on Tuesday night. It would appear that Vermezovic has buckled under the pressure but Khoza will seek more clarity at a later stage. "I will sit down with VV in an exit interview to hear him out. I naturally wished that he stayed longer and had more success at Orlando Pirates," said Khoza on Wednesday. "He has however added the Nedbank Cup and Carling Black Label Cup success at Orlando Pirates to his list of achievements. I wish him well into the future," he added. Who do you think should be Vladimir Vermezovic’s successor?